Controlling the spread of heel warts and other conditions that compromise hoof health requires implementing preventative measures. Routine trimming and the use of a hoof bath are important tools that will reduce the impact of lameness in a dairy herd. What Makes An Effective Hoof Bath? University research has recently introduced new recommendations for hoof bath sizing. Previously, hoof bath recommendations used shorter and wider designs, resulting in less steps and decreased contact time, making them less effective. 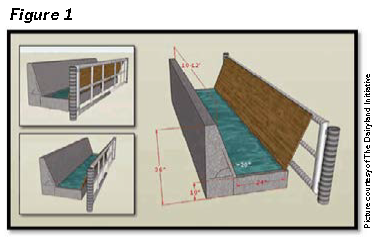 Studies have shown an increase in hoof bath effectiveness when dimensions of the hoof bath are longer and narrower (see Figure 1). New curb height recommendations help slow cow travel through the hoof bath, allowing more contact time with the solution and the cow’s feet. A slower pace and longer design causes more steps to be needed to pass through the bath. This increases soak time and solution penetration. Hoof Defense™: Why Use Chlorine Dioxide? Chlorine dioxide remains effective when in contact with organic matter and has a wider window of safety for handling. It is very soluble in water (10 times more so than chlorine), especially cold water. This high solubility makes the use of warm water unnecessary to hold the foot bath in suspension, resulting in a better quality solution overall.2 Chlorine dioxide based foot bath solutions are not currently approved on organic farming operations but the National Organic Program does allow chlorine dioxide as a disinfectant for cleaning equipment, feeding utensils and animal housing. 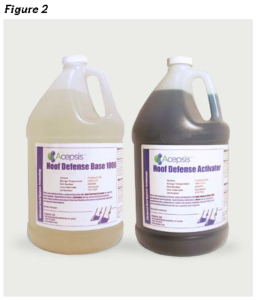 Hoof Defense™ is available as an activator and base formula (see Figure 2). See Table 1 for mixing directions and sizing recommendations. Farmers may choose to mix copper sulfate into the hoof bath at a reduced rate. Hoof Defense™ creates an acidic solution which holds the copper sulfate in suspension better than regular solutions, reducing the risk of it settling out and allowing a lower copper sulfate inclusion rate. To make an economical decision for herd wide control of hairy heel warts with proven, effective results, turn to Hoof Defense™. For tips on how to get the most out of your hoof bath protocol, contact Crystal Creek® at 1-888-376-6777 or visit our website at www.crystalcreeknatural.com. 1 Tomlinson, Dana. “Foot Fitness: Preventing Digital Dermatitis.” AgWeb. Farm Journal, 01 Oct. 2014. Web. 24 Apr. 2017.